SEPTEMBER 20 - 26, 2017 UCW 43 WWW.UPANDCOMINGWEEKLY.COM Best Furniture Store (New) Bullard Furniture 4901 Morganton Rd. (910) 864-5533 or www.bullardfurniture.com Bullard Furniture is a family- owned and operated business and has been providing the area with name-brand furniture op- tions since 1957. For 60 years, Howard Bullard, his family and their staff have worked hard building their reputation of being fair and trustworthy while serving Fayetteville, Fort Bragg and Cumberland County families. Bullard's 100,000-square-foot showroom is overflowing with beautiful, well- made pieces and boasts the largest furniture selection in the area. The extensive selection includes name-brand furniture, bedding, mattresses and accessories at affordable prices. The customer service is beyond reproach; there are no chain store atti- tudes here, just unparalleled products and attention to detail through every step of the process. This is what is known as "the Bullard experience." It's what makes shopping here a pleasure, fuels recommendations and keeps people coming back. From financing options to free delivery, the staff at Bullard Furniture is committed to their customers, and that is what makes this Fayetteville's favor- ite furniture store. Best Antique Store Diane's Vintage Market 242 Hay St. (910) 867-2000 or www.dianesvintagemarket.com When Diane Funari was looking for a place to open a shop, she knew downtown Fayetteville was the place to be. The quirky atmosphere and classic charm make it the perfect fit for her an- tiques and vintage wares. Funari spends a lot of time seeking out and purchasing truly unique pieces that bring personality to homes and businesses across Cumberland County. Call it retro, call it vintage, call it antique, you'll find it at Diane's. Best Bookstore (Used) 2nd & Charles 1920 Skibo Rd. (910) 487-3356 or www.2ndandcharles.com You never know what you will find at 2nd & Charles used bookstore. It might be just what you were look- ing for. But it will likely be the thing you never knew you couldn't live without. You're as likely to discover a brand-new passion as to bump into your 10-year- old self. The store is known for purchasing its stock from local people looking to exchange their lightly used books for cash or new books. However, it also accepts and sells a lot more than just books. An afternoon at 2nd & Charles can easily turn into a few hours of exploring books, comic books, CDs, vinyl, video game consoles, electronics, movies and video games. Items can be traded for cash or store credit. "Our Fayetteville customers have been extremely supportive," the owners said. "Fans gather for our pop culture events, game nights, cosplay, gaming arena and kids' activities every week. You find more than just the newest book; you find inspiration and an experience." 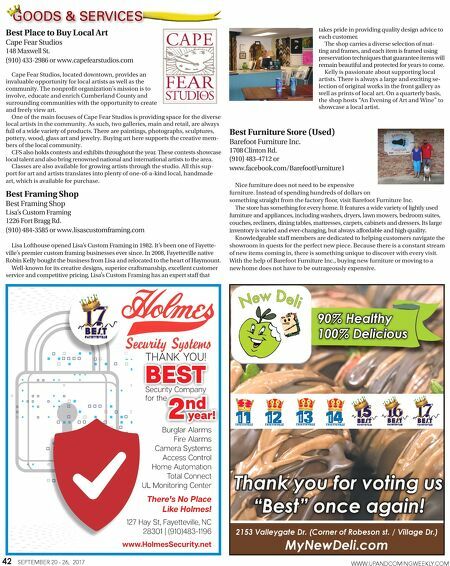 Thank You for Voting Us BEST 3200 CLIFFDALE ROAD • FAYETTEVILLE, NC 28303 910-868-5131 • 910-868-7351 (FAX) | www.fayettevilleacademy.com Fayetteville Academy is an independent, college preparatory school that offers Pre-K — 12th grade students a personalized education that prepares them for success in school and life. 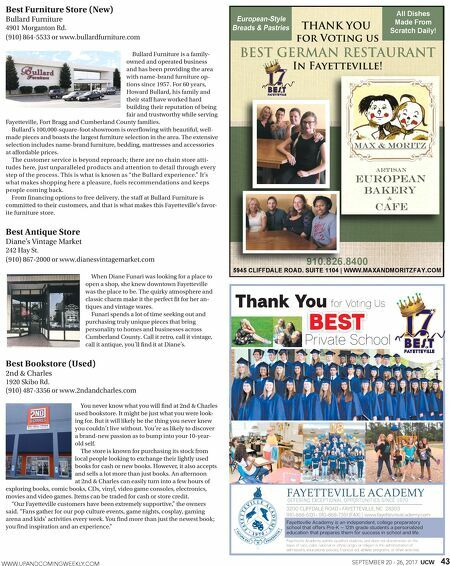 Fayetteville Academy admits qualified students and does not discriminate on the basis of race, color, national or ethnic origin, or religion in the administration of admissions, educational policies, financial aid, athletic programs, or other activities Private School THANK YOU for Voting us BEST GERMAN RESTAURANT In Fayetteville! 910.826.8400 5945 CLIFFDALE ROAD. SUITE 1104 | WWW.MAXANDMORITZFAY.COM All Dishes Made From Scratch Daily!